(By Suraj Dutta) It was finally time to hit the ‘Refresh’ button after taking a near 2 year break from biking-trekking, the last adventure being the full Ladakh-Spiti circuit back in July 2016. Picking an offbeat/ challenging destination had never been an issue with me and I stuck to resuming the saddle with my favourite getaway: the Garhwal Himalayas. I narrowed down upon the Kuari Pass trek over the Republic Day weekend as I remembered a promise to Rana ji – my friend from Joshimath to do the trek with him together. Day 1 (26th January): Leave Delhi by 25th midnight; reach Haridwar by 5 AM; rest for 2 hours and head for Joshimath – my final destination for the day. 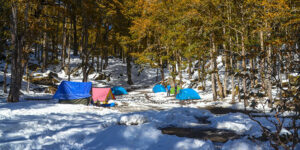 Day 2 (27th January): Start trek from Dhak village to camp at Gulling. Day 3 (28th January): Destination Tali Top or Chitrakantha, as feasible. 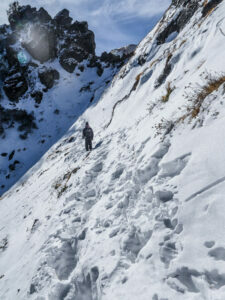 Day 4 (29th January): Early morning attempt to summit Pass and return to Dhak, recuperate. Day 5 (30th January): Ride back to Delhi and reach by night. According to the plan, I left Delhi on 25th midnight but little did I know what lay ahead once I took the Ghaziabad exit. Fog – dense fog enveloped the roads to such an extent that even 2 meter visibility was becoming a stiff task. I kept on pushing at the lowest of speed I ever did on my Thunderbird and it took 2 hours to finally cross Meerut. I know I am one nut-case rider but the volume of fog was making even me ponder if this was pushing foolhardy too much. Riding through this blind-fog with heart in mouth moment must be the most daring thing I ever did in my life. But challenges make trips all the more special. Thankfully the density lessened a bit once I reached Meerut Toll exit. However, my whole attire including my helmet was drenched in so much dew as if I just had a bath, fully clothed. 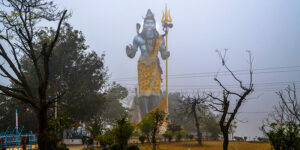 Reached Haridwar by morning 6 AM; the delay, thanks to the lingering fog. Day 1 passed by in a blur with very few stops, the longest one being at Srinagar where I captured the evergreen River Alaknanda flowing by in her full grace. 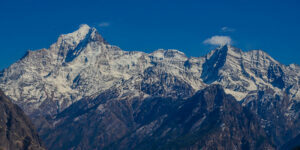 My base station Joshimath wasn’t a far call from thereon and I reached by 6 in the evening. My ever-smiling friend Ranaji was waiting for me with open arms and he propped me up with my guide Ashish, a relative of his and broke the news that he won’t be able to accompany me on the trek as some urgent work has come up in Pandukehswar the next day. That being that, I got busy buying rations for the trek with Ashish and had a good night’s sleep. I was up and about by 8:30 AM what with all the excitement for the upcoming trek. 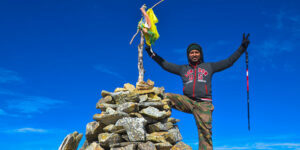 Ashish informed me that we shall be patching up with a couple of guided trekkers. Hira – their head guide gave us a car ride till Dhak village which would be our starting point for the trek. The long stony uphill trek starts from Dhak and we started hiking from 10:30 in the morning with the beautiful Nanda Devi and Donagiri peaks hovering in the background. Me being the slowest trekker led me to take longer breaks either to catch my breath or for frequent photo breaks. City life and a long break from trekking ensured I was out of shape but believing that willpower was stronger than physical prowess, I kept trudging uphill behind my guide Ashish. 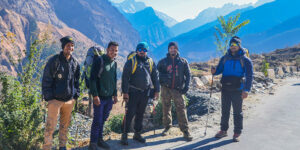 The trekkers rendezvous for a group pic (Guides – Girish and Ashish from left, followed by Bhupesh, me and Bhupender). My fellow trekkers had reached Gulling Top – our pit stop for the Day already and were done unloading the mules and setting up the camps. We start trekking by 9:30 in the morning. Our guides had intimated to us that it’s an easy day for us since it would be a 6 kms trek from Gulling to Talli top and that we shall be there within 3-4 hours max. Thanks to the bright weather, I captured a clear pic of the famed Hathi-ghoda parbat. We trekked for a couple of hours through the forest to emerge into the Khullara icefield giving us a clear view of the Nilgiri, Barmal/ Rattaban, Hatho-ghoda, Lampak I, Lampak II, Dunagiri and Hanuman peaks. The forest engulfs you again and its white-walker land thereon. 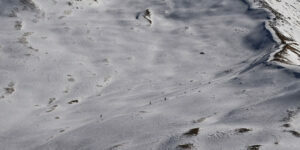 The climb is gradual now but one needs to be careful with the slip points and where the snow holds thin. We reach Talli top by 2 in the noon with the sun playing hide and seek from behind the tree line. It was the beginning of the season and hence the campsite was ‘almost’ empty. Only another group from Mumbai was there with two camps, returning after an attempt on the pass. 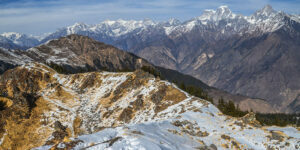 Final day of the trek dawned – and we set off from Talli by 10 AM in the morning through golden hued trees and sparkling snow. 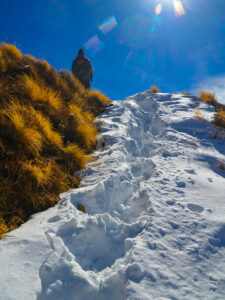 My fellow trekkers had left at 5 AM to attempt a summit climb on the heavily snowed up Pangarchulla peak. Girish, the other guide led the way briskly.Within an hour of trekking, we came upon the Chitrakantha ice-field which presented me with picture-perfect frames, what with all the pristine snow and the old Deodar and Cedar trees standing rock solid over the snow. Once I negotiated the vertical obstacle painstakingly slow, I was welcomed by the first view of Kuari Pass before us – on the opposite mountain. 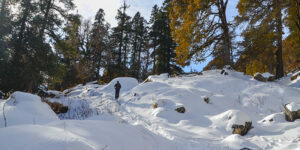 Surveying the amount of snow that engulfed the route till Kuari Pass, Girish remarked that it wouldn’t be possible to reach the vantage point of Kuari Pass at this time of the season. I asked: So till where? He remarked: Jhandedhar. Yours sincerely atop the Jhandedhar vantage point with the Chaukhambha, Nilgiri, Neelkanth and the Donagiri massif in the background. Girish pointed out to me that we shall be trekking till the peak seen in the foreground, about a kilometre ahead of jhandhedhar. In the background, the Pangarchula peaks can be seen. 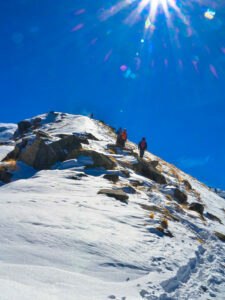 I hoped my co-trekkers made it till the summit and were returning to base by now. The sun beat down upon us as we ascended the peak, the snowy wind tried its best to push us off the trail. Another group was returning back to base at Talli. A view of the world beneath us from the top – the full mountain range presented to us in a panoramic view. 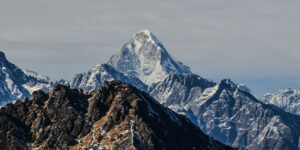 Neelkanth peak rose above all others and we felt as if we were standing at its height. The ice-field below us leading to Jhandedhar from the khullara campsite. We reached the top at 2 in the afternoon, and after spending a quality 1.5 hours at the peak, we started back for our base at Talli. How I wish I could camp at the top and gaze at the star trails of the Garhwal Himalayas!! • Due to non-availability of water at other points, we had to camp at Gulling and Talli over two days (distance of only 6 kms). 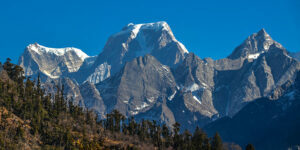 During season, it would be more prudent to camp a bit ahead of Talli, like Chitrakanth for more proximity to the Pass which would mean less time needed for trekking on the third day. • The best season for Kuari Pass trek is April-June and September-October. • You can either trek from Auli or from Dhak village. 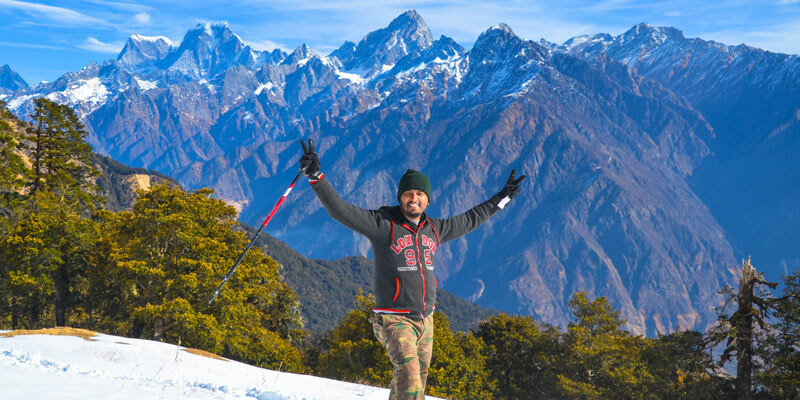 Both are at a distance of 16 kms from Joshimath but trekking from Auli side in season beginning is tough due to amount of snow but the bonus for the Auli approach is the Gorson Top. 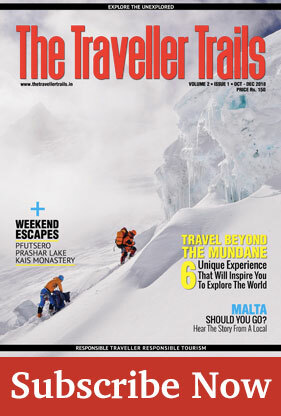 • The trek is overall of moderate grade for occasional trekkers and easy grade for seasoned trekkers. Don’t forget to bring back your litter from the beautiful mountains. 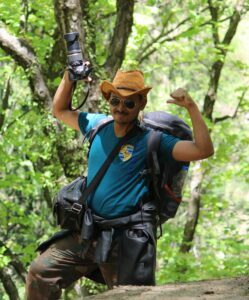 Suraj ‘Sufi Traveler’ Dutta likes to think of himself as an avid traveller with a sweet tooth for trekking to less explored trails. A A lawyer by profession, he was introduced to the unlimited vistas of travelling by means of long distance biking expeditions. Solo biking till date remain his preferred means of travelling and considers the Enfield Thunderbird as his most prized possession. Trekking to the Everest base camp remains at the top of his to-do list.